Hands down...one of the best parts of my job is getting the opportunity to interact daily with other small business owners! Whether they are designing wedding welcome gifts or pursuing another talent, I have so much respect for those who risk it all to follow a dream. From the outside looking in, business ownership can appear easy. I've actually gotten comments like..."God, I wish I could work from home and lounge in my pajamas". Or..."I'm so jealous of you. You play with ribbon." And my all-time favorite... "I'm sure you have plenty of time to do [whatever it is...fill in the blank]...you quit your real job." In reality though, when you leave a "real" job behind and start out on your own it is downright terrifying. Can I do this? No, seriously. Can I REALLY do this? What if I fail? What if all my naysayers were right? Oh God, what if I ruin our financial future? I lie awake some (actually, most) nights with my mind racing. I think non-stop about the business and, of course, worrying about its success or failure. In times like this, all it takes is one quick phone call with another small business owner, and I instantly feel reenergized. It's the auto reset button. They relate and sometimes that's all you really need in that moment to get you on a more positive path. It's this incredible energy I get from other entrepreneurs that is making me SO excited to announce what will now be a regular blog feature moving forward...the Vendor Spotlight. I'll be highlighting small businesses with the "it" factor. To me, this means they have the product, the packaging and the passion for their craft. And on top of that, they're amazing business partners of Marigold & Grey who are just a quick phone call or text away when I need anything at all. And by the way, I would gladly do the same for them. 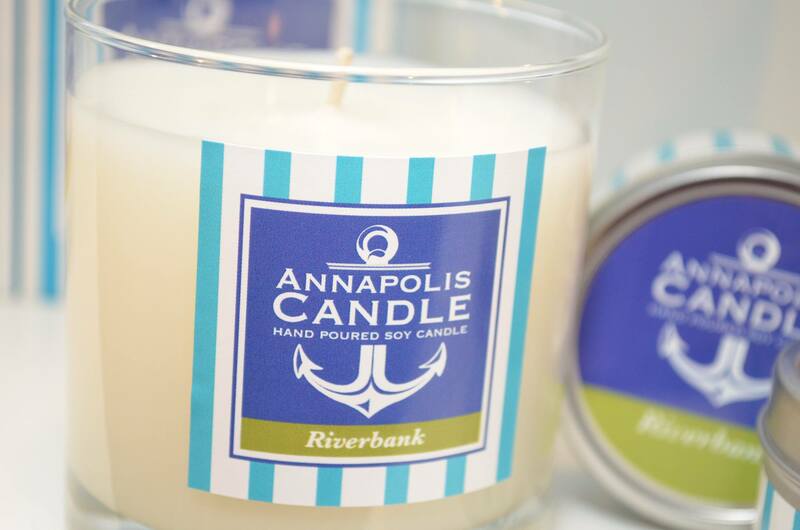 Our very first feature is Maryland-based Annapolis Candle! I recently had a nice little Q&A session with co-founder Michael Waldon who started the business with his wife, Jenny. This is one of the cutest, sweetest, most hard-working couples you'll ever meet and so, to me, it's no surprise that their brand and product are as adorable as they are high quality. What were you doing prior to starting Annapolis Candle? Prior to starting Annapolis Candle, Michael worked as a digital and video producer for a national news corporation in DC. Jenny was a stay-at-home wife and mom to our two daughters. We started to dabble in candle making because we have always been huge candle fanatics. We love the way candles add to the ambiance of a room or environment; they are the final step in design. Most people don’t think about sense of smell as part of the design process, but the sense of smell has such a strong connection to memory and pleasure. So, why not create fragrances we can enjoy in our own home? This is what initially compelled us to start the process. After much testing, we became comfortable in the science of candle making along with the knowledge of the home fragrance world. But there was something missing. There wasn’t a locally-created candle company. We could make it happen. What are you most proud of since starting the company? Aside from the initial step of creating Annapolis Candle, we are most proud that the name is bigger than we are. People may not know who we are but they have heard of Annapolis Candle. We have created a recognizable product that people love. We get so excited when we hear people say they’ve seen our product around town or were given one as a gift. What are your biggest challenges in starting and running a small business? The biggest challenge is always figuring out when to take the next step and what the next step is. We don’t want to try to do too many things that we can’t do them well, but we also don’t want to miss any opportunities that come our way. There is always some risk involved, and knowing when something is too risky can sometimes be a challenge. What are your goals for 2015, both personally and professionally? Of course we want to continue to grow but we also want to grow in what we can do. We are just getting into personalized wedding gifts and favors, and we are also creating private label candles for other local businesses and brands. We want to grown in what we can offer as a company to other local businesses and be an asset to them and their growth? We also want to do our business better. Life is always changing, especially with two kids, and we are learning better time management so we can enjoy our family time better. We also are learning which one of us does each job within the business best. As we grow, more responsibilities are added, so we are constantly figuring this out. How do you come up with your scents? What inspires your creativity? Testing, testing, testing. We are constantly trying out new fragrances and adding them together to see what results. Oftentimes a first attempt we can make better by adding a complementary fragrance to it. If we are going for a citrus fragrance, we will create four or five and test them out to see which we like best. It’s rare that we like one right away without any tweaking. As far as inspiration, we often try to imitate a fragrance from our favorite places and experiences. We have yet to duplicate the smell of our favorite getaway spot, which will remain a secret! A huge 'thank you' to Annapolis Candle for taking time out of the busy day to answer my questions. And, of course, thank you for your partnership!